KeiganMotor improves responsiveness and silence by adjusting motor parameters. Refert to Motor of KeiganMotor. When doing this page's content, update your motor's firmware and Keigan Core app to the latests. In case of adjusting motor parameters by using Keigan Core app, execute the following sequences. Use these commands, if you are a developer. Tap Motor icon in [Edit] tab. Input the following parameters by sliders or text fields. Tap saveAllRegisters to save the values to flash memory. In case of not doing "save", the parameters will be reset after reboot. If you want to reset the parameters to the firmware default values, tap resetPID button. Tap saveAllRegisters button to save them permanently in the same way. Basically, in case of attaching any loads to motor, increase Speed, Position and Current PID controller's proportional gains. It improves controllability.If they are increased too much, vibration may worse. For example, if you attach the official turntable to KeiganMotor and change Q-axis current PID controller's proportional gain from 0.2 to 0.25, the responsiveness will be improved. 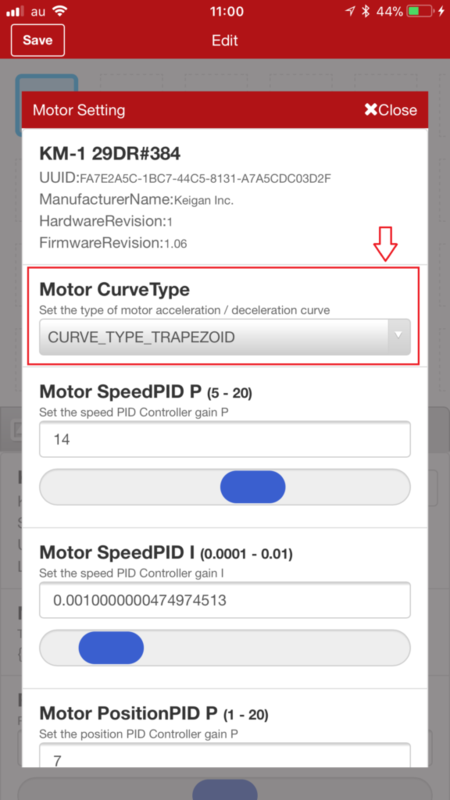 On the contrary,if you rotate motor at high speed, decrease Speed PID Controller's proportional gain to reduce vibration or noise.For example, if you rotate at 100 rpm with no loading, set Speed PID Controller's proportional gain to 1.0. Select curveType in [Motor Setting]. If you want to reset the parameters to the firmware default values, tap resetAllRegisters button. Tap saveAllRegisters button to save them permanently in the same way. Motion Control ON with trapezoidal acceleration and deceleration curve.